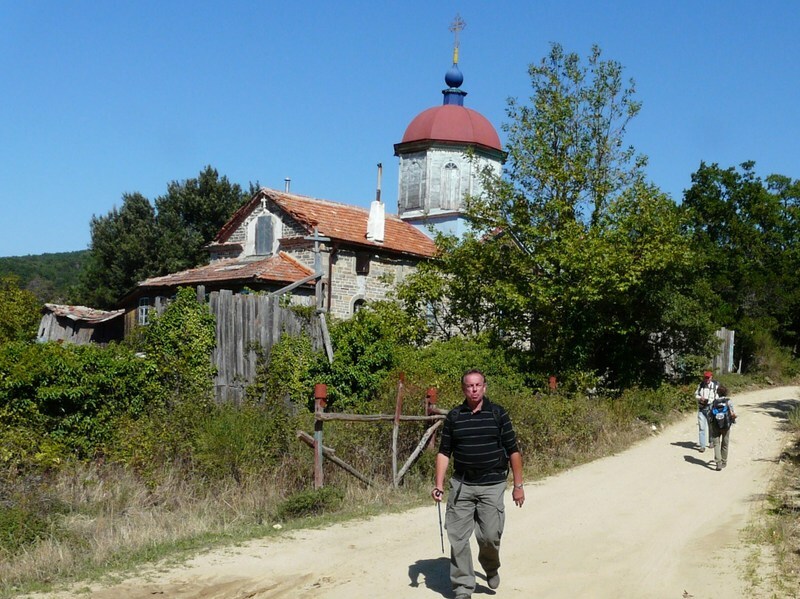 After paying a visit to the main church in the Old Russian monastery we went out to see one of the most mysterious buildings on Mount Athos. The problem is: you can’t reach it. Look at this wooden fence that surrounds this building (F on the map in 972). If you want to get some more information, books about Athos do not help you much. Here is a picture from the book of Erich Feigl (from 1960/70?). Instead of helping us it brings on more questions, as we can later see from the pictures I will show you. And by trying to Google for more info I was surprized to end up at my own weblog, because our reader Hans Overduin already gave some beautifull pictures of Paleo Monastirion from 1997 – see nr 356). The building F with a hexagon dome and the outside wall, covered with wooden planks. If you have a closer look at the picture from the Feigl book does not match the pictures I took. The planks on the Feigl picture form a shape with curves or edges and I could not find this on the F-building. The windows also are different. Could it be a picture of a distroyed part of the place? It might be so, just have look at the first picture of post 356, where a structure along the “old wall” shows up, that was totaly disappeard in 2009. And finaly a picture from my friend Jitze, with a good overview of the mysterious building F.
A lot of questions arrise after showing these pictures. But I am afraid that the answers are not easy to find, although, the collective memory and knowledge of our readers usually brings us a long way! But it is time to move on. It is only 14.00 h. on day one and yet the day is not over! Courtyard Palio Monastiro, time to walk on. Next time more about the route to Karyes. This entry was posted in 19 Panteleimonos, Paleo Monastiro, trip 2009: Herman's group, trip 2009: Wim's group and tagged paleo monasterion. Bookmark the permalink. Building F is most likely a small church, as you suggested in post 356. Given the shadows on the picture and that you visited this place around 14.00, it is also oriented to the east. It has the “classic” layout of a Russian village church with a wooden outer porch (but without belltower). Why the walls of the sanctuary are clad with wood is unclear to me. Perhaps it was just for protection? The fence (which is absent on the last picture of post 356) seems to indicate that the building has become too dangerous to visit and/or that it will (soon) be restored.